While just about every market group has seen a significant rebound off the Christmas Eve lows, two notable laggards have been Tobacco and Tech Hardware. These are two groups that you don’t normally associate with each other, but both have been profoundly weak over the course of the last few months. After rallying nearly 9% from its lows, the Tobacco group is down over 4% this week after Altria (MO) was downgraded at Morgan Stanley on Tuesday due to concerns over changing smoking patterns, disruption in the space (marijuana and e-cigarettes), and increased regulatory risk. As the chart below shows, a weakness for the Tobacco industry has been nothing new as the group did nothing but go down in the last year, falling over 34%, including an 18.1% decline in Q4. Regarding the Q4 decline, you may counter that the rest of the market was down big in Q4 as well. That’s true, but considering the fact that the group has always been considered defensive in nature, that kind of weakness is extreme. One big contributor to last year’s Q4 weakness was the fact that the company went out and took a 35% stake in e-cigarette maker Juul for $12.8 billion. We understand that desperate times call for desperate measures, and in the face of disruption companies need to be bold, but based on the terms of the investment, Altria valued Juul at $38 billion which is 45% of its current market cap! 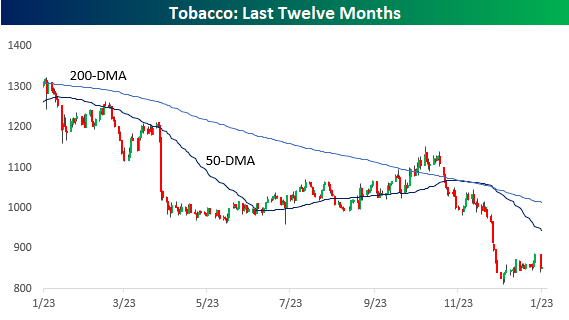 Tobacco has been no stranger to the 52-week low list over the last year or so, but in recent months it has found a new roommate in Technology Hardware. 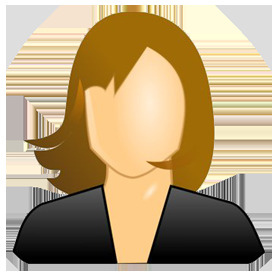 This group has seen an epic fall from grace of the last six months quickly turning from market leader to laggard. From its high in late-September, this group has lost more than a third of its value, and while more than one stock has contributed to the decline, the big driver has been Apple (AAPL), which is down close to 40%. Apple doesn’t make cigarettes, and its iPhones are still in much higher demand than a pack of smokes, but like the problem of weaker demand for Altria, sales of iPhones have been slowing as investors have been holding on to their phones longer in response to higher prices. Ironically enough, in the wake of Apple’s decline, it now trades at just about the same valuation as Altria in terms of their P/E ratios. One key difference, however, is that while Apple’s dividend yield of 1.92% is slightly below the S&P 500’s yield of 2.02%, Altria has a yield of 7.1%!